Video-assisted thoracoscopic surgery (VATS) is now well established as an alternative to open thoracotomy for major resections of lung cancer and benign disease. Compared to open surgery, the minimally invasive approach has a number of benefits in the immediate post-operative period that include reduced pain, better lung function, shorter hospital stay, improved cosmesis and lower risk of developing chest infection. VATS lobectomy is equivalent to open surgery in terms of long-term outcomes, is less invasive and enables more patients to commence and complete postoperative chemotherapy if required. Furthermore, minimally invasive techniques are cost effective and better tolerated by our patients. Professor Tristan Yan acquired the specific skills of VATS lobectomy in Edinburgh, from working closely with Dr William S. Walker, who is the first person in the world performed minimally invasive lung resection more than 20 years ago. The main advantages of the Edinburgh's posterior approach in our experience is the excellent visualization that is obtained of the posterior hilum which facilitates dissection of the airways and branches of the major pulmonary artery. Thus, in the Edinburgh approach, the tips of the instruments come towards the operating surgeon and are therefore easily seen whilst in use, definitely increasing the safety of dissection. More importantly, the lymph node packets are clearly seen, allowing thorough lymphadenectomy (lymph node removal), which facilitate total clearance of tumors. The Edinburgh approach is a very safe, reproducible method for VATS major lung resections, which has withstood the test of time over the last 20 years. To help you understand what is involved during your operation, Professor Yan here uses a surgical video to demonstrate the techniques of VATS lobectomy (removal of one lobe, 15-30% of total lung volume) (Video 1), VATS segmentectomy (removal a specific portion of a lobe, 5-10% of total lung volume) (Video1) and VATS pneumonectomy (removal of an entire lung on one side, ie. 2 to 3 lobes at once, 50% of total lung volume) using the Edinburgh approach. The extent of resection is dependent on the tumour status and the underlying lung function. We have adopted minimally invasive lung resecetion (VATS or Robotic) as the surgical strategy of choice for all cases of peripheral lung cancer of 7 cm or less in diameter and for suitable benign disease. This criterion is decided according to the ‘VATS Lobectomy Consensus Statement’ by 50 minimally invasive thoracic surgeons worldwide, organized by Professor Tristan Yan in 2012. Lobectomy and anatomic segmentectomy are our standard procedures. It is possible to utilise VATS/Robotic techniques in patients with more advanced disease such as moderate chest wall or central involvement and, rarely, for pneumonectomy (removal of the entire lung on one side) in patients with low bulk central involvement. However with the trend towards lung conservation strategies, we now reserve pneumonectomy for rare individuals in whom broncho-vascular (airway-vessel) reconstruction is not feasible. You need to obtain a baseline lung function before your consultation with Professor Yan. This is an essential test using a combination of spirometry and CO transfer factors to see if you are fit enough for a lung resection. In addition, exercise testing and heart assessment are carried out as relevant to the individual patient. Echo assessment of pulmonary artery pressure is undertaken in patients at risk of pulmonary hypertension. Few patients are declined surgery on the basis of poor lung function data. This serves as guidance for post-operative surveillance and respiratory management but our experience supports the view that even patients with a significantly reduced lung function (>2 standard deviations below normal) still fare well with a VATS approach. A contrast-enhanced computed tomography scan of the head, chest, abdomen and pelvis, positron emission tomography-CT (PET-CT) is performed in all patients with lung cancer under consideration for resection. We have previously demonstrated that even in patients with no radiographic features of mediastinal (central) lymph node spread, there is a 5% false negative rate for detection of lymph node metastases (spread) when compared to the gold standard of mediastinoscopy (surgical sampling of lymph node) and lymph node biopsy. 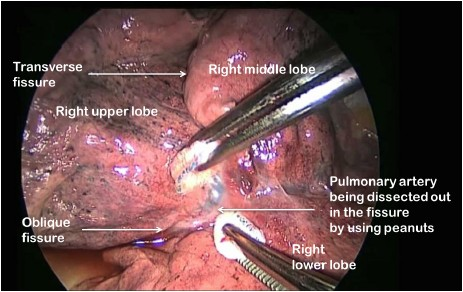 We therefore perform preoperative lymph node sampling of stations 2 and 4, contralateral station 4 and the subcarinal (station 7) groups (consistent with current European Society of Thoracic Surgeons guidelines) in all patients being considered for VATS lobectomy for malignant disease in whom the procedure is not otherwise contraindicated. In patients considered suitable for lobectomy, the minimally invasive approach is attempted in all patients meeting size and stage criteria. This is because in experience hands, the “keyhole” approach is readily achievable. The only absolute contraindications are those patients in whom the pleural cavity is obliterated on radiological grounds or who clearly have very proximal disease requiring a pneumonectomy. The conversion rate from a minimally invasive lung resection to an open chest operation is approximately 5%. Following induction of anaesthesia, the patient is positioned in on the side. The hands are placed in the “prayer” position in front of the face and the operating table is manipulated to extend the chest (Figure 1). As soon as the double lumen endotracheal tube (airway tube) is confirmed to be in the correct position, whilst the patient is still in the anaesthetic room, ventilation is switched to the lung on the opposite side to optimise deflation of the lung that is to be operated upon. The respiratory rate can be increased to 20 breaths/min or more in order to reduce the lung ventilation volume and hence the degree of mediastinal excursion due to ventilation. Through experience, we have found that these measures provide a more stable operating field. We rarely use central lines or urinary catheters but always use an arterial line and large bore venous cannulae. Intercostal nerve blocks are used for perioperative analgesia in preference to epidural anaesthesia. A local anaesthetic paravertebral catheter is placed at the end of the operation and remains in place for 48 hours. In addition, a patient-controlled morphine pump is supplied to our patient in order to achieve maximal comfort after the operation. 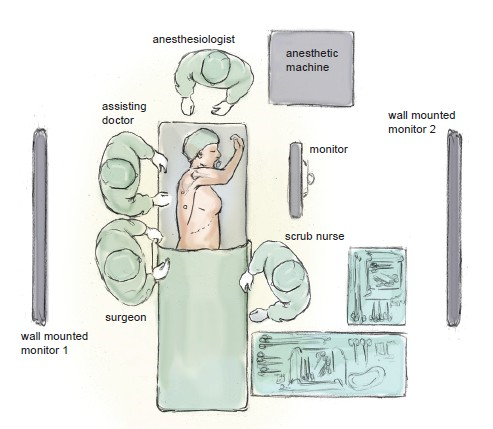 The positioning of the surgical, anaesthetic and nursing teams and the equipment is illustrated in Figure 1. The surgeon and the assistant stand at the patient’s back with the screen directly across the table and the scrub nurse obliquely opposite. We utilise two additional large (55 inch) wall-mounted high definition screens to optimize visibility. One is positioned opposite the scrub nurse and provides an operative view, which also allows anaesthetic staff, circulating nurses, and observers to follow the progress of the operation closely. The other is positioned opposite the surgeon and provides large-scale high-definition radiology images, which the surgeon can view continuously in order to inform intra-operative decision-making. 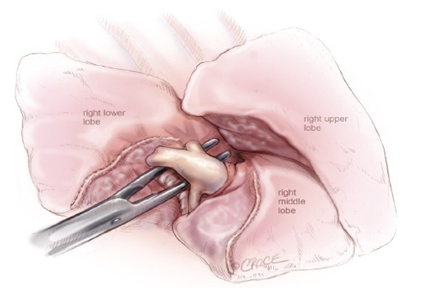 Two to three access ports are used and port position is standard irrespective of the lobe to be removed (Figure 2). 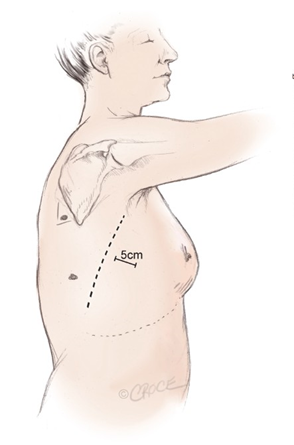 A 4-5 cm (approximately 2 inches) utility port site incision is made in the sixth or seventh intercostal space (whichever is the larger space). The camera is temporarily introduced through this port to facilitate safe creation of a 1 cm incision posteriorly. A port is inserted to accommodate the camera, which is positioned in this posterior port for the remainder of the procedure. A further 1.5 cm port is created in between these two incisions. The incisions are very small compare to the traditional approach where the incisions are usually 20-30 cm (approximately 12 inches). We prefer a zero degree 5-10 mm high definition video thoracoscope as this provides a single axis view allowing easy correction of orientation. Lung retraction is performed using ring-type sponge-holding forceps to allow gentle manipulation. Long forceps (30 cm) with or without mounted tiny swabs are employed for blunt dissection. These are particularly useful for exposing the major vasculature at the base of the oblique fissure, cleaning structures and clearing node groups. A range of long instruments specific for “keyhole” operations are used carefully as probes to create a passage between the lung tissue and major central structures. Endoscopic clips are used to ligate small vessels whilst large vessels and lung tissues are divided using specially designed endoscopic stapling devices to ensure haemostasis (control of bleeding) and aerostasis (control of air-leak). With the advancement on instrumentations, we can perform almost all major lung resections through small incisions with significant improvement in our patient outcomes. 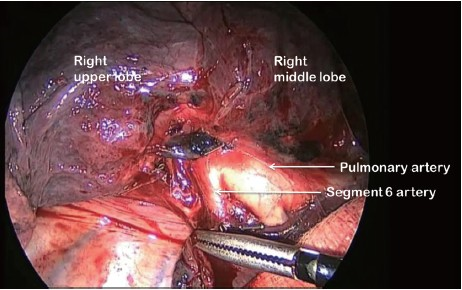 A video-imaged thoracoscopic assessment is performed to confirm the location of the lesion, establish resectability and exclude unanticipated disease findings that might preclude resection. Video 1 is an edited video clip, which demonstrates several key points of VATS lobectomy via the Edinburgh approach. The first step is to identify the pulmonary artery (the largest vessel in the lung). In some patients this artery is immediately visible, but in the majority of cases, it is revealed by separating the overlying lung tissue using blunt dissection with mounted tiny swabs (Figure 3). If the space between adjacent lobes does not open easily or is fused, an alternative approach utilising a fissure-last dissection should be considered. Although more technically demanding, in experienced hands, it is readily achievable. For all lobectomy procedures excepting middle lobectomy, the lung is then reflected forward and the back of the lung is dissected free. With the Edinburgh approach, this crucial step is very straightforward. After dividing he posterior fissure, the pulmonary artery is now clearly seen on the right side (Figure 4) and the distinction between the upper and lower lobes is established. Dissection then proceeds according to the lobe to be resected. During division of the truncal pulmonary veins, we place a central vascular clamp on the vein so that the division of vein will be very secure. We carefully remove all resected specimens from the thoracic cavity in a retrieval bag to avoid contamination of the wounds with cancer cells. A size medium sized apical drain is placed through the chest cavity and is usually removed on the first post-operative day subject to a satisfactory chest X-ray and air-leak status. Patients are observed on the ward or in the high dependency unit overnight. Analgesia is provided using a morphine patient controlled analgesia pump and a local anaesthetic (paravertebral) catheter placed under vision prior to port site closure. Early mobilisation is strongly encouraged with the availability of physiotherapy seven days per week, and discharge as early as post-operative day 3 is often possible. We have presented a safe, reliable and reproducible approach to VATS lobectomy. VATS lobectomy has been shown to compare favourably with open chest operation in terms of immediate post-operative recovery and is considered to be oncologically equivalent (with some data suggesting VATS approach produces better long-term survival). We believe that the increasing use of minimally invasive techniques for lobectomy and other major pulmonary resections would be highly desirable for our patients.